I haven't blogged much recently. I've been watching the new Mayor's team settle in and been gently talking to people to find out what they think about things. And what I'm noticing is that things are going a bit strange in the world of London's cycling investment. Birdcage Walk and the area outside Buckingham Palace. The cycle track there was meant to open this summer, then this December. Sources now tell me we'll be lucky to see anything by summer 2017. 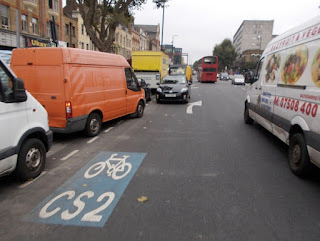 Or cycle highway 11 up to Swiss Cottage. Consulted on back in February, the consultation report came back with a positive in August and the Mayor committed to building it. But since then, lots of silence. Actually, not so much silence, as lots of time for anti-cycle infrastructure groups to plan how to attack the cycle highway and many rumours from all sorts of different sources of compromises all round. 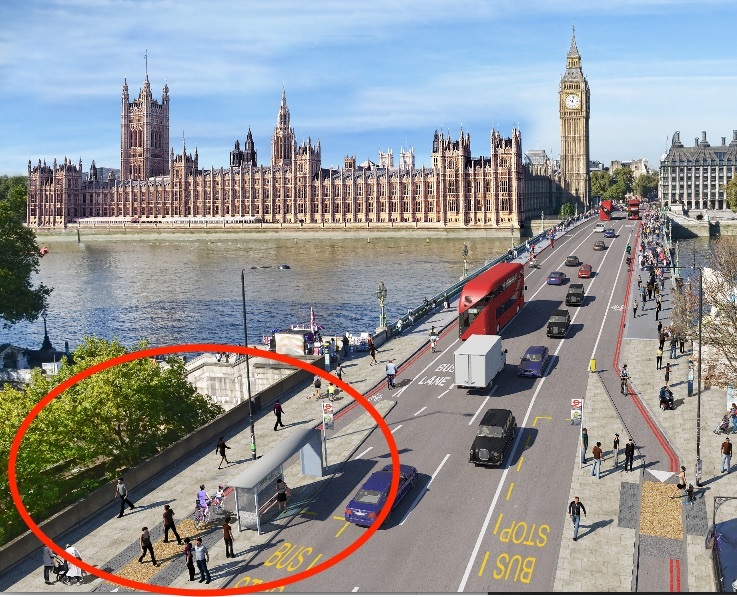 One particular compromise that is worthy of more attention is the northbound bus stop at the southern end of Westminster Bridge. Let's look at the puzzled world of this bus stop. TfL's plan is to build a cycle path over the Bridge. The cycle path will go past a bus stop that I've marked in the red circle on the picture above. The bus stop is next to St Thomas's hospital. In fact, for several hundred yards below this picture, it is already an area of 'shared use' pavement - used by both cyclists and pedestrians. And it is really suboptimal. The new design is meant to give more space to people on foot and also to make cycling here much safer, especially through the horrendous junction just south of the Bridge. Yet for some reason, that we have yet to get to the real bottom of, St Thomas's chairman has gone bezerk about this bus stop. He has spent £10,000 of NHS cash on a military-style PR campaign against the bus stops. 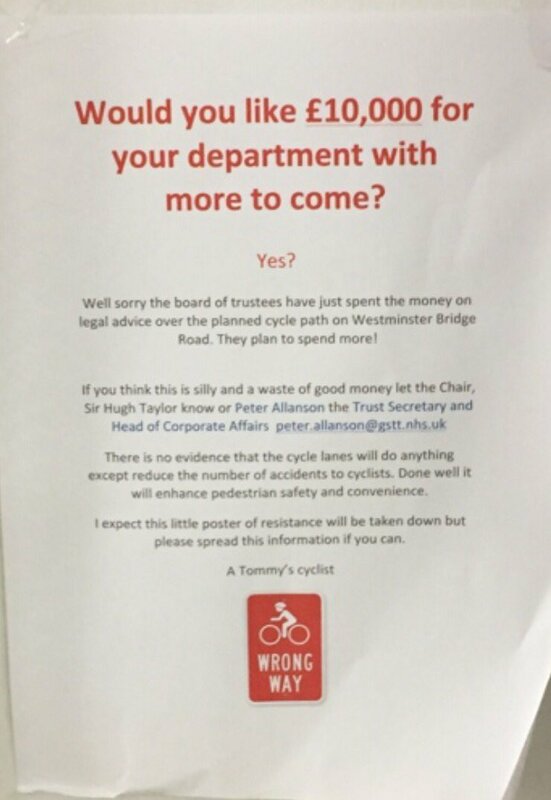 This is a much more organised campaign than a few years ago when St Thomas's hospital (and other landowners) tried (and failed) to ban cycling on the South Bank. And to me, it's really not clear what the Chairman of St Thomas's is actually objecting to. Let's look at a few of the claims flying around. The Trust Secretary of St Thomas's hospital is Peter Allanson. 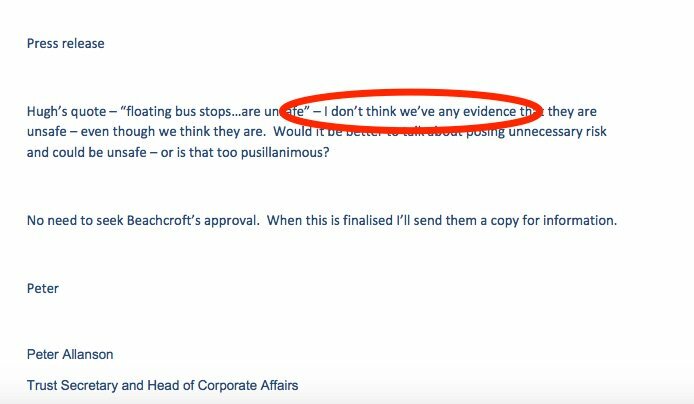 Back in May, Allanson sent a note to his Chairman stating the Trust had no "evidence that [this design of floating bus stop is] unsafe. That same week, however, the same Trust Secretary was happily emailing Trust members and other senior big wigs telling them that this floating bus stop design was "dangerous for pedestrians and cyclists". 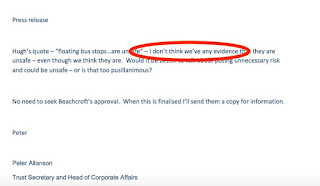 On the one hand, then, the Trust's secretary claims that floating bus stops are 'dangerous'. On the other, the very same week, he admits internally that he has no evidence for his claim. Very odd. There followed a deliberately placed article in the Evening Standard about 'angry cyclists' that was planted by the hospital's director of communications. And further articles in other local papers all to stir up faux anger and outrage about the cycle paths. Let's just take a step back here. The situation as it stands is that the stretch of pavement up to (but not quite including) this bus stop is already shared use. Pedestrians crossing from the hospital back to the bus stops heading south already have to mingle with cyclists coming off the South Bank and then anyone walking towards Lambeth is on a shared use foot and cycle path. 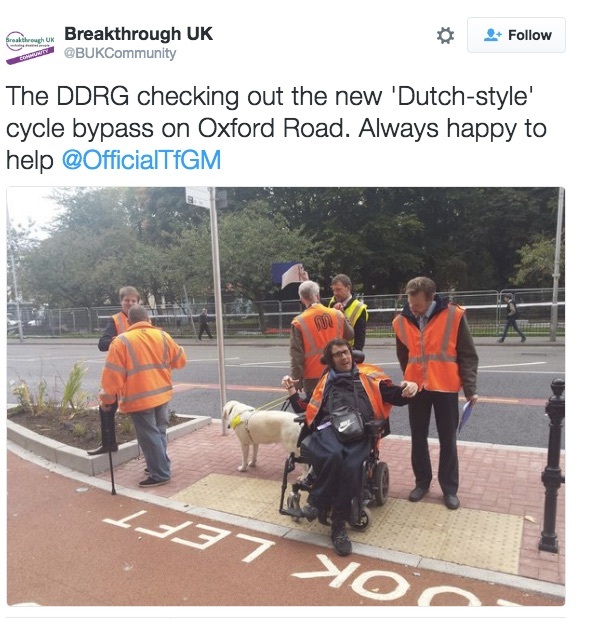 People legally cycle on it to avoid the horrible road junction. And why might they do that? Well, one cyclist and one pedestrian have been killed right here in recent years. Both by people driving cars, and a further dozen seriously injured, also by people driving. No pedestrians or cyclists have been seriously hurt or killed in collisions with each other here. But the current layout is a mess with bikes and pedestrians competing for the same space with no clarity about who goes where. The local Labour councillors issued a statement last week suggesting they thought it would be possible to come up with a compromise that keeps everyone happy. "We believe that an eventual solution has to both protect pedestrians and users of the hospital and not endanger the life of a single cyclist. Both these objectives can and must be met, and we're engaging constructively in the process." The reality is, however, that floating bus stop don't seem to actually endanger pedestrians or users of hospitals. There's a floating bus stop outside the Royal London hospital in Whitechapel and that's doing just fine, with not a single reported collision. There's a floating bus stop too just near the eye hospital on Manchester's Oxford Road working fine. The 15+ floating bus stops in Brighton have been working fine for a couple of years. You'd think that a hospital, of all places, might look at the evidence and conclude that, designed right, a floating bus stop could work perfectly well. In fact, you'd think a hospital wouldn't spend £10,000 of its own money fighting something it has no evidence doesn't work. what our local councillors want here? Meanwhile, our MP Kate Hoey, and our councillors are trying to find a compromise that works for everyone. But whatever their good intentions, that compromise will be based on a complete lack of evidence that floating bus stops are in some way 'endangering' pedestrians and cyclists. So, they are a looking for a solution to a problem that doesn't exist. What's more, people who should know better actually know this. The Trust's chairman had a very detailed meeting with Lambeth Cyclists and Wheels for Wellbeing who talked him through why the bus stop bypass, if designed consensually, will work well. What I think will happen is that the fake outrage drummed up by St Thomas's will be used to force TfL to build something really rubbish, like the section on Cycle Super Highway 2 where it passes Whitechapel Market. The protected cycle track here just gives up and dumps cyclists between parked vans on the one side and buses on the other. To finish off then, there's no evidence the floating bus stops are 'dangerous for pedestrians and cyclists'. But the hospital trust has spent £10,000 of NHS cash convincing our local councillors that they are. And as a result, our councillors and our MP are promising a compromise that means cyclists won't be 'endangered' and pedestrians will be 'protected'. I can't work out why St Thomas's hospital is doing this. If there was clear evidence that St Thomas's was on to something, then that would seem fair enough. But the opposite is true. What's really bothering me is that Westminster Bridge is just a symptom of something wider. All across London, cycle highway schemes that were supposed to have been finished by now, are 'in progress'. But not an awful lot is happening. 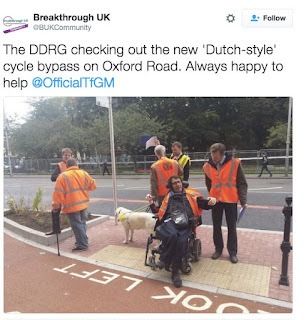 And people, like St Thomas's hospital, are basically making up stories and using them to try and get cycling schemes delayed, postponed or generally watered down. It doesn't bode well at all. Looking for Banquet halls or Banquet halls in ECR/Mahabalipuram? Our Landmarkpallavaa beach resort is becoming one of the favorite event hubs in ECR/Mahabalipuram. Book now to get a good deal.